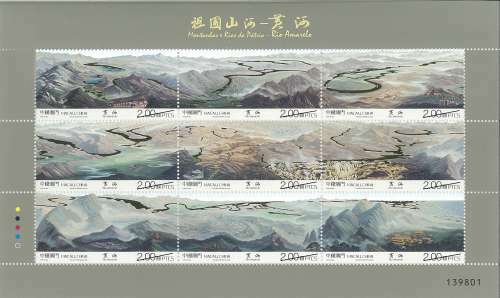 STAMP ISSUE "MOUNTAINS AND RIVERS OF THE MOTHERLAND – YELLOW RIVER"
The Yellow River is called the “mother river” of Chinese nation. Like a cradle, the Yellow River valley has nurtured, nourished and proliferated generations and generations of people in China, countless heroes and saints in history and the splendid Chinese culture which contributes significantly to world civilizations. 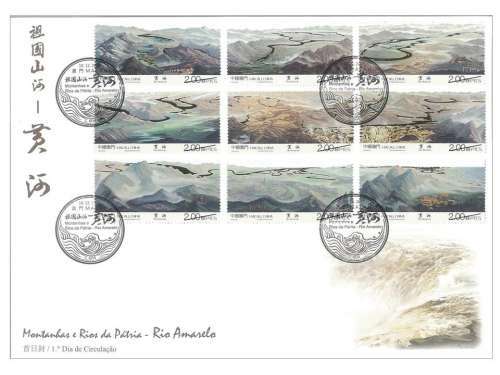 Macao Post will issue the stamp theme “Mountains and Rivers of the Motherland – Yellow River” on 10th December, 2015. Yuan Jia, the famous contemporary Chinese artist, compressed the “Ten Thousand Miles along the Yellow River” into a set of nine stamps, the entire Yellow River valley is printed with hot foil stamping with gold to highlight its imposing landscapes and magnificent view. 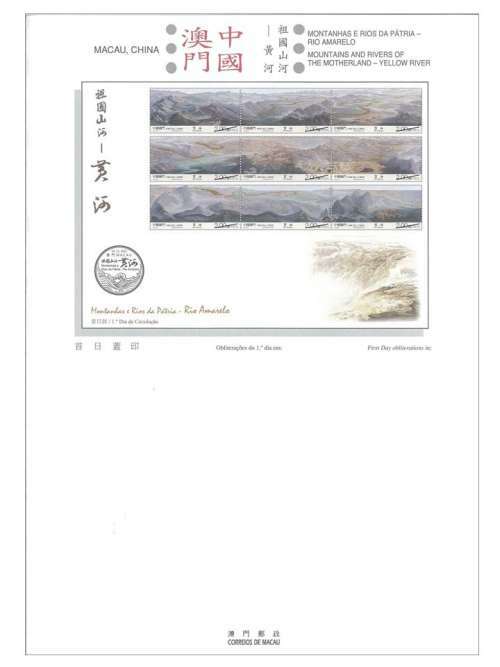 This stamp issue also includes a prestige stamp booklet with 9 stamps in se-tenant format at 570 mm long, it showcases the panorama of the entire valley of the Yellow River, and it is the longest set of stamps ever issued in Macao. 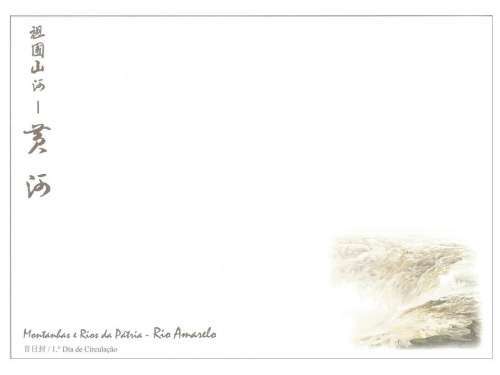 The total face value of 9 stamps is 18 patacas, and the booklet priced at 25.00 patacas each. Due to the limited quantity of prestige stamp booklets, the sales-quota per queuing customer on the issue date is 3 booklets. The limited quantity of First Day Cover and Information Brochure (without stamps) will be available for sale at the Philatelic Shop of Macao Post Headquarters on the issue date, customers can produce the philatelic products by affixing the stamps from the booklet with the issue postmark for your collection or mail to your beloved friends and relatives. The stamp designer of this issue is Mr. Yuan Jia, and the text of the information brochure is written by Mr. Liu Jianhui. This is the last of the sixteenth theme in 2015. The previous issued stamps are “Lunar Year of the Goat” on 05/01/2015, the label stamp “Lunar Year of the Goat” on 28/01/2015, “110th Anniversary of Rotary International” on 16/02/2015, “Mainland Scenery VI” on 01/03/2015, “25 Years of AICEP” on 27/04/2015, “Macao Wetlands” on 05/05/2015, “110th Anniversary of the Birth of Xian Xinghai” on 13/06/2015, the label stamp “Old Streets and Alleys” on 30/06/2015, “150th Anniversary of Guia Lighthouse” on 08/07/2015, “10th Anniversary of the Historic Centre of Macao as World Heritage” on 15/07/2015, “Water and Life” on 31/07/2015, “70th Anniversary of Victory in the Chinese People’s War of Resistance Against Japan” on 03/09/2015, the definitive stamps “Old Streets and Alleys” on 22/09/2015, “Festivity” on 09/10/2015, “Literature and its Characters – Jiu Ge” on 30/10/2015, “Science and Technology – Magic Squares II” on 12/11/2015, and “Tai Chi Chuan” on 30/11/2015. 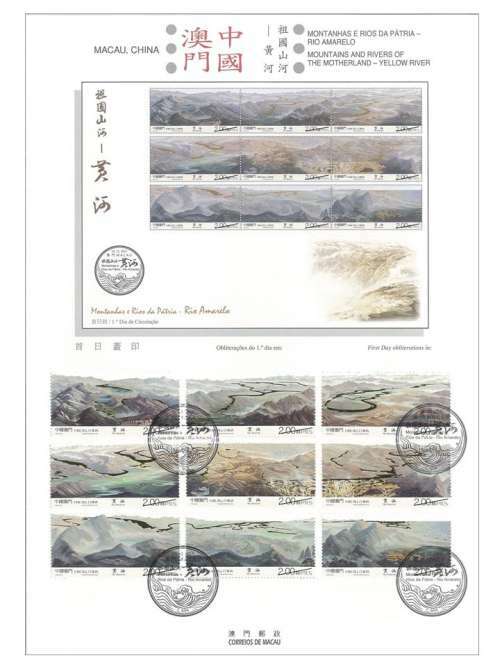 Technical Data of Stamp "MOUNTAINS AND RIVERS OF THE MOTHERLAND – YELLOW RIVER"